The chairman of FOB, attn. 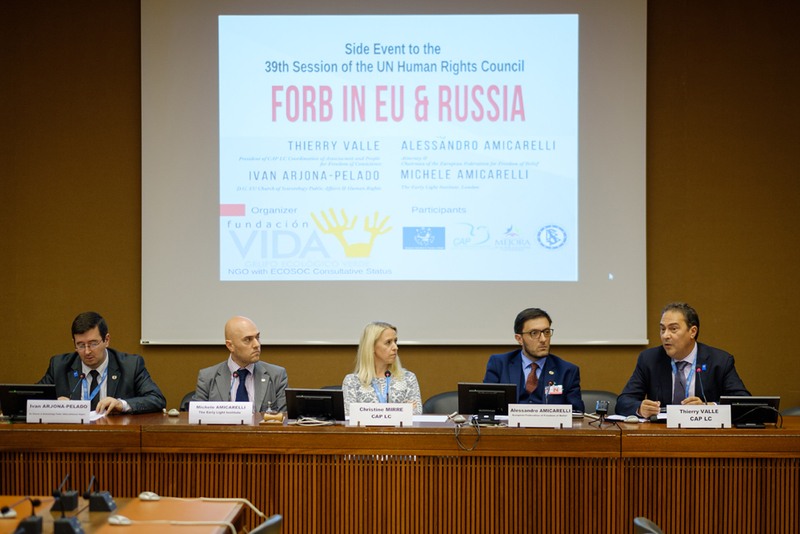 Amicarelli and other delegates took part in the event FORB IN EU AND RUSSIA organised by the UN ECOSOC accredited association « Fundacion VIDA » during the 39th session of the Human Rights Council in Geneva on the 18th of September 2018. The panel, moderated by Christine Mirre of CAP LC, included Thierry Valle director of CAP LC, federated to FOB, Ivan Arjona-Pelado of « Fundacion VIDA », that hosted the event, Michele aka Michael Amicarelli, founder of « The Early Light », and Alessandro (Alex) Amicarelli, chairman of the « European Federation for Freedom of Belief (FOB) ». 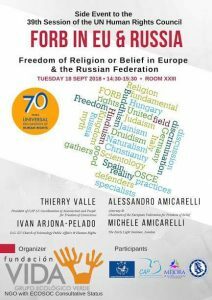 Ivan Arjona-Pelado highlighted cases of discrimination especially in Hungary and Russian Federation stressing that « while more and more European countries respect and protect the right to freedom of religion of Scientologists, some others are still having to intensively learn to properly apply the UDHR » (UDHR: Universal Declaration of Human Rights). 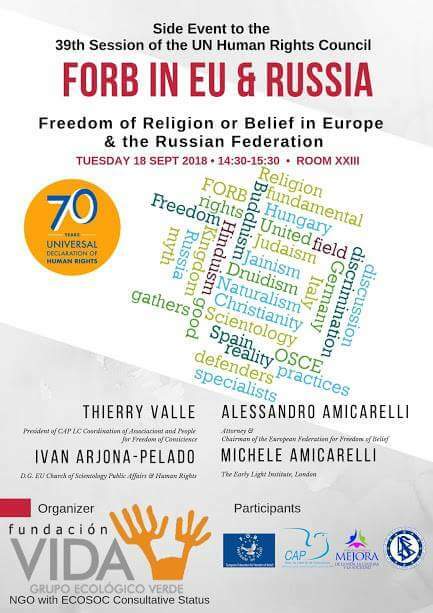 Thierry Valle of CAP LC, FOB federated and UN ECOSOC accredited Coordination of Associations and Persons for Freedom of Conscience stated « On this 70th anniversary of UDHR, « CAP Liberté de Conscience », urges the Russian authorities to implement the religious plurality for all ». Michele aka Michael Amicarelli, founder of « The Early Light », recalling some philosophical postulates of freedom stated that « human beings are really free when they can realize their lives’ purposes as long as they don’t interfere with the freedom of other people and don’t break the established law », specifying in this regard that « real freedom enables the persons’ free wills to exert free actions without any burdens which may prevent them from doing so; such freedom will possibly contribute to the good and joy of others ». He recalled the recent Ministerial to Advance Freedom of Religion in the world, called and hosted by Secretary of State Michael Pompeo that was held in Washington DC on 23-27 July 2018, where the chairman spoke about the religious persecution in China, reporting about the harsh persecution suffered by Muslim Uyghurs, and then focussing on the complaints he filed with the United Nations Working Group on Arbitrary Detention in Geneva, on behalf of members of « The Church of Almighty God »; these complaints received the support of Lord Alton of Liverpool in the British Parliament and of Lord Ahmad of Wimbledon for the British Government. The Ministerial he said « was an exceptional event where representatives of 87 governments and of international organisations discussed matters related to FORB and the way to facilitate its improvement in the world ». « The outcome of that event was the creation of an international movement for freedom of belief of which FOB is proud to be a member and to which we are happy to contribute », he added. He stressed that « We must keep working together and expand the network keeping an eye on issues around the world. Likewise it is vital to give visibility to our work and to work in close partnership with national and international organisations bodies and representatives in order to build a better and more united society ». He then concluded his speech by saying that « Indeed people have a natural right to freedom and this freedom was enshrined 70 years ago in the Universal Declaration of Human Rights and in other international and regional instruments such as the UN International Covenants of 1966 and the European Convention on Human Rights and Fundamental Freedoms of 1950. While the States have to acknowledge people’s freedoms, and people have to enjoy their freedoms in compliance with the law, the same States should not impose undue restrictions only aimed at preventing people from enjoying their freedoms, and any limitations to the personal freedoms should only be aimed at respecting all people equally ».